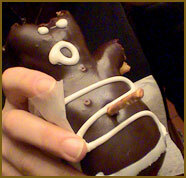 There's a wild and wacky donut shop in Portland called VooDoo Donut. They create donuts that are rolled in Capt'n Crunch and donuts sprinkled with Kool-Aid. They have your classic maple bar only theirs is topped with a slice of bacon. (Think about it, it's a great combo.) They once concocted a donut that had a NyQuil center, however they discovered the FDA didn't really approve of that confection. On a sunny Saturday, while hanging out downtown, we asked our girls if they wanted to get a treat and they opted for VooDoo. On ward! When we pulled in the parking lot we noticed it was a bit more crowded than usual. At the door we are told a wedding was about to begin, however we could come in and observe. Sure, why not. Well,... this crowd was a bit different than what our daughters are used to and the look on their faces was worth all the calories of all the donuts in the land. We were "guests" at a Goth Wedding. Not only does VooDoo make great donuts, the co-owner is an ordained Minister and will preside over your wedding ceremony. The event was held with honor and humor. It was an amazing thing to watch. Yes, there was more black lipstick and leather worn here than at your "normal" wedding. However, the attire didn't hide the love that this couple had for each other or the support and deep affection their friends had for this new union. At first we weren't sure if we should have our girls be involved with this party. (Is it going to freak them out?!) But I'm so glad we did. It takes all kinds of people to make this World work. I'm glad we were welcomed in despite our, by comparison, bland appearance. I'm glad none of us judged with our eyes but with our spirit.